In this New York Times bestselling epic fantasy, a young girl raised by a witch, a swamp monster, and a Perfectly Tiny Dragon must unlock the dangerous magic buried deep inside. 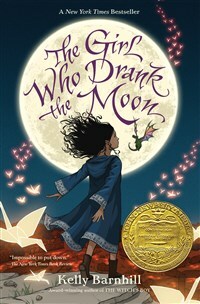 The New York Times Book Review calls The Girl Who Drank the Moon “impossible to put down . . . as exciting and layered as classics like Peter Pan or TheWizard of Oz." Kelly Barnhill lives in Minnesota with her husband and three children. She is the author of four novels, most recently The Girl Who Drank the Moon, winner of the 2017 John Newbery Medal for the year’s most distinguished contribution to American literature for children. She is also the winner of the World Fantasy Award, the Parents’ Choice Gold Award, and the Texas Library Association Bluebonnet Award, and has been a finalist for the Minnesota Book Award, the NCTE Charlotte Huck Award, the SFWA Andre Norton Award, and the PEN/USA literary prize. Visit her online at kellybarnhill.wordpress.com or on Twitter: @kellybarnhill.